The long history of war and hostility between India and Pakistan are clearly reflected in Pakistani public opinion. Indeed, most in Pakistan view India as a serious threat and many believe it poses a greater threat to their country than the Taliban or al Qaeda. But putting the past aside, majorities believe that it is important to improve relations between the two countries. Much of the tension within the relationship between India and Pakistan stems from the long-standing conflict over the situation in Kashmir. Anxiety over the dispute is prevalent among Pakistanis, and most feel strongly that the situation needs to be resolved. There is widespread concern over the threat posed to Pakistan by India. More than eight-in-ten (83%) believe that India is a serious threat to their country, with most saying it is avery serious threat (69%). 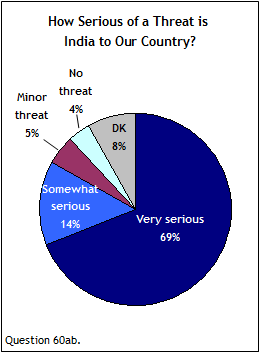 By comparison, only a handful of respondents think that India is a minor threat (5%) or not a threat at all (4%). Notably, more Pakistanis cite India as a serious threat to their country than say the same about the Taliban (73%) and al Qaeda (61%). Anxiety over India is nearly universal among Pakistanis in the Punjab province, where over nine-in-ten (95%) believe that their country’s neighbor is a serious threat. A similar fear of India is common among those living in the North West Frontier Province (NWFP) (88%), and to a lesser extent among respondents in the Sindh province (63%). When asked to name the greatest threat to Pakistan – among India, the Taliban and al Qaeda – more Pakistanis cite India than mention either extremist group. Nearly half (48%) say that India poses the greatest threat to their country, while significantly fewer say that about the Taliban (32%). 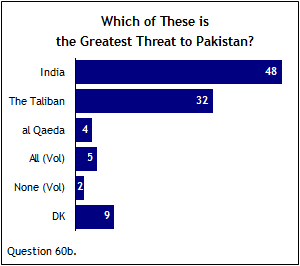 Just 4% say al Qaeda poses the greatest threat to Pakistan. Concerns about India are highest in Punjab, where 70% cite India as the greatest threat to the country. By contrast, roughly half in Sindh (51%) and even more in the NWFP (59%) cite the Taliban as the biggest threat to Pakistan. Additionally, respondents who affiliate with the Pakistan Muslim League-Nawaz (PML-N) are more likely to name India as the greatest threat to Pakistan than those affiliated with the Pakistan Peoples Party (PPP) (67% vs. 35%). While many Pakistanis remain worried over the threat posed by India, there is widespread agreement that it is important to develop better relations between the two countries. Two-thirds believe is it is important for relations between Pakistan and India to improve, with more than a third (37%) saying that it isvery important. On the other side, roughly a quarter (23%) say that it is not too important or not at all important to improve relations. The long-standing conflict in Kashmir remains a major obstacle to the development of closer ties between India and Pakistan. Indeed, a large majority of Pakistanis (88%) view the situation in Kashmir as a big problem, with most (74%) saying it is averybig problem. Few in Pakistan (9%) think the Kashmir conflict is a small problem or not a problem at all. Worries about the dispute over Kashmir are common among the old and young, men and women, rich and poor, as well as though those with some education and those with no formal education. Moreover, concern about this issue is nearly ubiquitous among respondents in the Punjab province, which borders Indian-controlled areas of Kashmir: more than nine-in-ten (96%) in Punjab believe that the situation in Kashmir is a big problem. Many also believe it is important that the dispute over Kashmir be resolved. 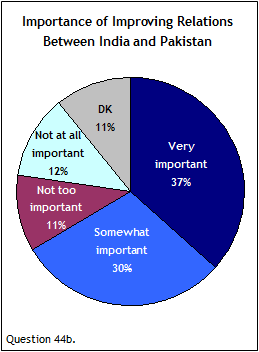 Nine-in-ten (90%) say it is important for this to happen, and three-quarters (75%) think that it is veryimportant. Just 4% say it is not important to find a resolution.